Due to an issue with loading the data last night, Cognos will not be available until tomorrow morning (01/10/19). The UNT SYSTEM Budget Analytics Team has corrected the issue and expect for Cognos to be ready tomorrow. The ePar system is experiencing intermittent issues with workflow routing in which some ePARs are not following the programmed workflows. Not all ePars are affected. System is troubleshooting to identify the cause and fix. In the meantime, if users become aware of an ePAR that does not have the appropriate parties in the workflow, please do not finalize the ePAR. Please send an email to epar_help@untsystem.edu with the ePAR number, and they will restart the workflow and administratively approve for the areas already completed, so that those individuals are not asked to approve the ePAR again. On 11/28, the DAIR team identified an issue with the Cognos reports that affected the data being pulled. The reports were down for most of the day while the team worked to correct the issue. Reports are now back online and available for use. Cognos Is Down Until Further Notice. The DAIR team identified an issue on the Cognos reports that was causing the reports to pull incorrect data. The reports are currently down while the DAIR team works to resolve this issue as quickly as possible. Join us at First Fridays this Friday, August 3rd from 2:30-3:30 to review year end close procedures and to get your year-end close questions answered! Can't attend? Powerpoints will be posted afterwards. For immediate information regarding year end close, visit the newly added Year End Planning page! The Year End Planning page contains information on Deadlines, Closing Rules, and Guidelines for Covering Deficits. AV Journals Now Include Line Descriptions. Beginning 07/27/18, AV journals (gift journals from Advancement) will include specific gift fund descriptions in the “Journal Line Description” field. Previously, the general description “Contributor Relations” was used in the “Journal Line Description” field. This change is being made to address campus users’ need for more information from the AV journals. Effective immediately, ABAs must be submitted online via EIS. Paper forms will no longer be accepted except in instances where EIS combo edits (rules) do not recognize a chartstring as valid. View the ABA Training Guide for submission instructions. To request access complete the ABA Access Request. ABAs may now be submitted electronically via EIS. Paper ABAs are no longer accepted. Please refer to 06/06/18 revised announcement. From the Home Screen, select Main Menu > Campus Self-Service > Transfers(Budget & IDT) > ABA IDT Entry. View the ABA Training Guide for submission instructions. Users requiring access should complete the ABA Access Request. Paper forms (PDF Excel EXAMPLE) will still be accepted. Users should submit only one version (electronic or paper) to avoid duplicate processing. Questions and paper ABA submissions should be directed to the Budget Office. New UNT System Approver Proxy Request Form & Proxy Approver Timeline. Approver proxies are now limited to 90 days unless Vice President approval is received. The UNT System Approver Proxy Request Form has been updated to reflect this new policy. The form can be used for both ePro and ABA proxy requests. ABA approver proxies cannot be admin level staff. A PI Dashboard has been created within PeopleSoft itself that provides summary and detailed information for active awards summarized on the same screen without having to use a separate sign-on or navigate over to COGNOS. See this flyer for more information! 2% Merit raises have been approved effective February 1st and will be reflected on the March 1, 2018 paychecks. Please refer to the Staff Merit Guidelines Fiscal Year 2018 document for details. The Recommendation for Staff Merit Increase Above 5% form must be completed for merit recommendations above 5%. If you have questions, contact the Budget Office at ext. 3233 or Campus Human Resources at ext. 2281. First Fridays Cancelled December 1st. First Friday's with the Budget Office is cancelled today, December 1st. Budget Office Holiday Open House - if you have questions we can help or just swing by for cookies & milk - Admin. #102 - 2:30-3:30 today, December 1st. Funds 830035 Unrestricted Gifts (Gen) and 885000 Departmental Discretionary should not be used to record gifts. For those gifts not requiring a unique fund, please use 303-349000 Schol/Rest-Departmental (for scholarship gifts) or 303-300001 Dep/Rest-Dept Discretionary (for non-scholarship gifts). These rules apply to gifts received today and going forward. Gifts currently carried in 885000 or 830035 will be reviewed at a later date. The office of Advancement will no longer deposit gifts to chartstrings containing 202-830035 or 202-885000. The new online Learning Portal that faculty, staff, and student employees should use to register for training is NOW LIVE. Training registration is no longer accessible through the employee portal. Please review the Learning Portal Guide for instructions on registering for courses. 1. Project Budget Summary Report and Project Transaction Detail Report: The ledger from which data is pulled has been updated from the General Ledger to Commitment Control. This update was completed for the Departmental reports in April. Balances on the report will now match EIS Budget Overview without any timing delays. 2. Department Budget Summary Report: Revenues now roll-up to the base Account level instead of to the D-Level. 3. 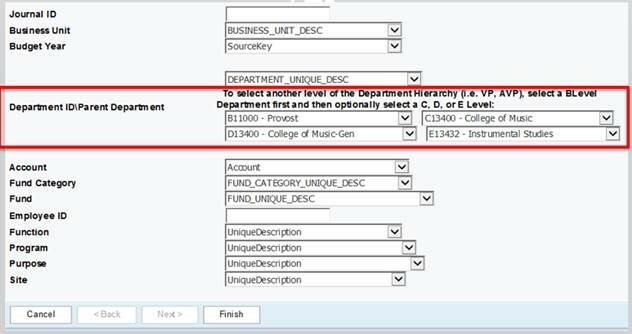 Department Account Detail Report: The account roll-ups changed from the C-Level to the D-Level. 4. Department Payroll Transaction Detail Report: Enhanced Search parameters allow the report to be run at the B/C/D/E level Org Dept (i.e. VP, AVP) level. Process for Increasing Payroll Encumbrance for New Hires. When hiring, if the hire amount exceeds the encumbered amount and additional funds are required, the hiring manager or department representative should complete a new HRM-4 (include appropriate approvals) to identify the source of the additional funds and forward to the UNT Budget Office. Also, email Budget.Office@unt.edu and HREmployment@untsystem.edu indicating that the new HRM-4 is in process. Please include a copy of the HRM-4. Summer AOP Showing as Spring AOP. Summer AOP is showing a journal line description in Cognos to be Spring AOP. JE_51842 is Summer 2017 and JE_48167 is Spring 2017. September Payroll Reporting Issue - CORRECTED. The Budget Office posted a correction journal, HR0055447B, on Friday, 10/13 to record September payroll expenses that previously bypassed the budget check process. The correcting journal HR0055447B is not drillable in COGNOS. If journal HR0055447B is drilled on, a “No Data Available” message will appear. To view detailed payroll information, users should run the Department Payroll Transaction Detail report using the original Journal: HR00055447. Do not search for HR0055447B. There is no underlying detail associated with the correcting journal. Please refer to the attachment for a step-by-step guide on running the Department Payroll Transaction Detail report. An issue was identified with the September payroll journal, HR00055447, that posted on October, 2nd . The journal bypassed the budget-check process. As a result, September payroll expenses are not reflecting in Cognos reports or in Budget Overview in EIS. The issue is limited to budgetary chartstrings which are those with a Fund Cat of 105, 120, and 200. Disencumbrances posted appropriately and are not affected. FSS is working to correct the issue as quickly as possible. New HRM-4 and Offer Letter Process. Implementation of a new process between HR and Budgets has recently been enacted. HR is now using the amount which is encumbered for offer letter approvals. If the salary in the offer letter exceeds the encumbered amount, HR will direct the department to the Budget Office. Offers less than the encumbered amount are not affected. To avoid delays, please make sure to submit a HRM-4 to increase the encumbrance amount prior to requesting an offer letter from HR. Purchase Order Roll Forward Complete. The PO roll process (to move POs from FY17 to FY18) has been completed. POs with an existing receipt and voucher were not eligible for the automatic roll process and are still carried in FY17. If you are carrying an encumbrance in FY17 due to a PO not rolling, and if you have further transactions needed against that PO, please contact the BSC for assistance. Double Telecom Charges in August. Telecom charges for both July and August posted in August (period 12). If you have questions about your Telecom charges please contact Telecom Billing. Purchasing Pre-encumbrance and Encumbrance COGNOS Data Issue - Corrected. The issue with the purchase order rollover process that was causing incorrect data in the pre-encumbrance (requisition) and encumbrance (purchase order) fields in COGNOS was corrected last Friday, 09/22. The issue was originally announced on 09/13 with an interim solution provided on 09/20. The DAIR team has identified an error on the Project Budget Summary report arising from a manual journal entry that posted on 09/08. DAIR is working to resolve the issue and expects to put a correction into testing later this week. 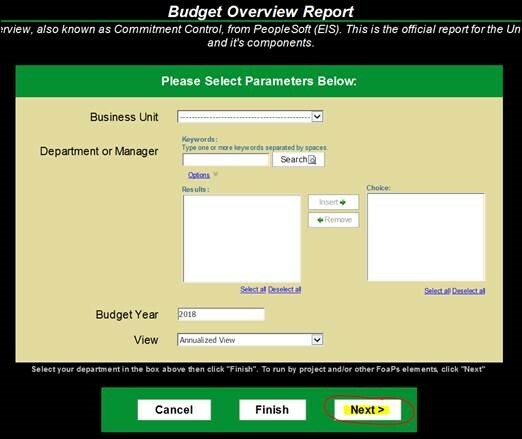 In the interim, please refer to the Budget Overview Report to view your project balances. The ledger selections on this report must be changed to reflect grants. Please refer to the steps below. 3. A new prompt page will appear. 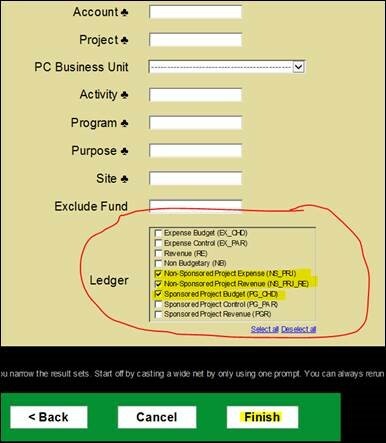 Check the “Sponsored Project Budget (PG_CHD)” ledger to view sponsored projects (grants). Check the “Non-Sponsored Project Expense (NS_PRJ)” and “Non-Sponsored Project Revenue (NS_PRJ_RE)” ledgers to view non-sponsored projects. Purchasing Pre-encumbrance and Encumbrance COGNOS Data Issue. On September 9, 2017 the Purchase Order (PO) rollover process that moves open FY17 POs to FY18 was executed. The process resulted in some incorrect pre-encumbrance and encumbrance data in COGNOS. A plan to fix the data has been devised and will be implemented on or before Friday, September 22, 2017.